May 30, 2014 A Swiss professor wrote on Facebook that Belgian officials may be part of a conspiracy to falsely present the Brussels Jewish museum shootings as anti-Semitic. 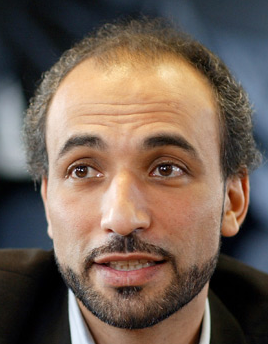 Tariq Ramadan, a Geneva-based lecturer on Contemporary Islamic issues at Oxford University in Britain, speculated on Tuesday that the slaying of four people last week at the Jewish Museum of Belgium was a deliberate attack on Israeli secret agents. Ramadan was for a time been banned from entering the United States for financial contributions he made to Hamas fronts. Ramadan denied knowing that the charities were Hamas fronts and the ban has been removed. ‘The two tourists targeted in Brussels worked for the Israeli secret services,’ Ramadan wrote, citing media reports. An unidentified shooter killed two Israeli tourists, Enamuel and Mira Riva, and two museum staffers, Alexandre Strens and Dominique Sabrier. Despite complaining that he has been dismissed as a “conspiracy theorist”, this is not the first time that Ramadan has expressed conspiratorial theories. The GMBDW reported in July 2013 that Tariq Ramadan had authored an article in which implied that the overthrow of former Egyptian President Mohamed Morsi was orchestrated by a conspiracy involving the US and Israel together with what he alleges to be their Salafist allies. In March 2012, despite media reporting on the extremist Islam and anti-Semitic background of the so-called “Toulouse scooter killer”, the GMBDW reported that Ramadan wrote “Religion was not Mohamed Merah’s problem; nor was politics” but that the interpretation of the killings was driven by political motives.